When a debtor doesn’t pay a debt, a creditor may try to access money owed to the debtor by someone else. The creditor can do this through a process called garnishment. Alternatively, a creditor may seek to set-off the debt against other money of the debtor. Creditor has threatened to garnish the client’s wages or bank account. Creditor has taken steps to garnish the client’s wages or bank account. Garnishment is a statutory remedy governed by part 1 of the Court Order Enforcement Act. It allows a creditor to seek a court order to access money owed to a debtor by someone else (that is, a third party). The most common money “attached” (redirected to a creditor) are wages and bank accounts. For example, suppose an employer (the third party) owes wages to an employee (the debtor). The creditor may be able to garnish a portion of the wages for payment on the debt. When a debtor has money in a bank account, the money in the bank is considered a debt owed to the debtor. The creditor may be able to garnish the bank account for payment on the debt. Joint debts cannot be garnished unless all the persons to whom the debt is owed are also judgment debtors (a person who has been found in a court judgment to owe money to another party, called the judgment creditor). For example, a joint bank account may be garnished only if all the account holders are also judgment debtors. Set-off is a remedy that is similar to garnishment but does not require a court order. It is often used by banks when a client has savings on deposit with the bank while having an overdue loan with the same bank (but not necessarily the same branch). In such cases, the bank may be able to set-off the amount of the overdue loan against the amount in the savings account. For example, if the client has an overdue credit card account of $7,000, but also has $5,000 in a savings account, the bank may apply the funds in the savings account toward the credit card debt, thus reducing the savings account to zero, and reducing the overdue credit card account to $2,000. Many credit card and loan contracts have terms allowing banks to use set-off. Some private pension benefits and many types of government income benefits, such as welfare payments, are exempt from being seized by creditors. (For example, see section 29 of the Employment and Assistance Act.) This means that a creditor cannot use a garnishing order to make the government or pension plan administrator pay the benefits, or any portion of them, to the creditor. 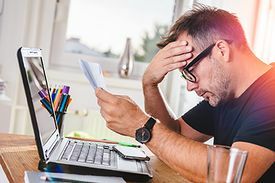 Also, there is some case law indicating that such benefits may be exempt from garnishment or set-off even after they have been deposited in a bank account, especially if the purpose of the account is to receive the benefit. (See Metropolitan Toronto (Municipality) v. O’Brien and McIntosh v. Laronde.) However, this area of the law is not fully developed. Government can give itself a statutory right to set-off payment of some government benefits against debts owed to the government — one example being that the Canada Revenue Agency can take at least a portion of a person’s Canada Pension Plan benefits in payment of arrears of taxes. To get a garnishing order against a bank account, a creditor must start a legal action in either Small Claims Court or Supreme Court (see the section on Court Processes in Consumer and Debt Matters). The garnishing order can be obtained without a court hearing and without notice to the debtor. The creditor files an affidavit and a draft order with the court registry. A registry official processes the draft order and gives the completed order to the creditor to serve on the third party and the debtor. The affidavit and order must follow a format set out in the schedules at the end of the Court Order Enforcement Act. Because creditors often start legal action and get the garnishing order simultaneously, garnishing orders against bank accounts can take debtors by surprise. The first notice debtors may get is when they are served the paperwork for the legal action and the garnishing order at the same time. Or, a debtor’s first notice may even be the bank calling to say a cheque has bounced because the account was emptied by the garnishing order. To get a garnishing order against wages, a creditor must have a judgment. Unlike bank accounts, wages cannot be garnished before judgment. To get a garnishing order against wages, the judgment creditor follows the same procedures for garnishing a bank account. When a garnishing order is served on a bank, the bank is obliged to take from the debtor’s account as much as is needed to satisfy the order. A bank account can be emptied completely this way. When a garnishing order is served on an employer, the employer is obliged to send the court registry only a portion of the debtor’s wages. That portion is usually 30% of the net wages due — that is, 30% of the amount payable, after statutory deductions for things such as income tax, Canada Pension Plan, and Employment Insurance. The other 70% is exempt from garnishment. When garnishment is for child or spousal support, the exemption is only 50%. If the debtor has only been threatened with garnishment, there is no order or affidavit to review. If the debtor has actually been garnished, get a copy of the garnishing order and the supporting affidavit that must have been filed as part of the application for the order. In most instances, the debtor has been served with the order already. If the debtor does not have either the order or the affidavit, obtain copies from the court registry where the order was issued. Whether garnishment or set-off is threatened or an order has actually been issued, the matter must be resolved urgently. Review the entire financial circumstances of the debtor. Enforcement action by one creditor may indicate that the debtor has several creditors, and thus the solution should include all creditors. When dealing with a specific creditor, satisfy yourself that the creditor’s claim is valid, both as to the debtor’s liability and as to the amount claimed by the creditor. If either issue is in doubt, you should probably refer the matter to a lawyer. Where a set-off has occurred, there may be no practical solution, except the stop-gap measure of opening a new account with a different savings institution (not at another branch of the same institution), so that further set-offs will not occur in the future. However, if the funds have been taken from an account that is used to receive government income benefits, it may be possible to get the set-off cancelled. In some cases, the bank may voluntarily reverse the set-off if an advocate shows them a copy of the statute that grants the funds exempt status. If the bank does not reverse the set-off, then the only solutions may be to open a new account at a different institution or make an application to court to have the funds refunded. Where a garnishing order has been made and money has been paid to the court registry, there are two main remedies available. If a garnishing order was made before judgment (such as against a bank account), a debtor can make an application to set aside the garnishing order. The application would not deal with the merits of the creditor’s claim; rather, it would deal with the validity of the garnishing process. For this reason, you and the client must consider carefully whether it is worthwhile to make such an application. An application to set aside a garnishing order is heard by a judge of the court where the order was issued. The debtor either files the application in Small Claims Court or files a Requisition in Supreme Court. In special circumstances, the application can be heard at a registry nearest to where the debtor resides, rather than a more distant court registry. Consult registry staff on how to make such an application. The grounds for setting aside a garnishing order made before judgment can be found in the Court Order Enforcement Act. Under section 3 of the Act, the affidavit in support of the garnishing order must contain certain information about the claim against the debtor. If the information is wrong, the order will probably be set aside. In general, judges require strict compliance with the Act. Reviewing a garnishing order before judgment for these technical defects probably requires a lawyer because there is a great deal of case law on the requirements of section 3. Under section 5 of the Court Order Enforcement Act, a judge has the discretion to set aside the garnishing order, even if the order and affidavit are technically sound (that is, there are no defects under section 3). The Act says that the judge can do this when it is “just in all the circumstances” to do so. Cases decided under this section have usually been decided on the basis of the merits of the case itself, and also on the basis of how much hardship there would be to the debtor if the money were to remain in court. Additionally, the creditor may be able to have the garnishing order set aside if it was made against an account used to receive government benefits on the grounds that, as noted above, such funds are exempt from seizure. If the garnishing order has been made after judgment (such as against wages), section 5 of the Court Order Enforcement Act is the only realistic ground you can use to have the order set aside (apart from the exempt government funds exemption noted above). The same test applies. However, when a judge sets aside an order made after judgment, an instalment payment order must form part of the order to set aside. The advantage of this requirement for the debtor is that so long as the instalment payment order is being complied with, section 5 says the creditor cannot take other judgment enforcement steps against the debtor (such as having a court bailiff seize assets). Clients may be concerned about being fired if their wages are garnished. You can point out Court Order Enforcement Act, section 27, which states that employers cannot dismiss or demote employees solely because of the service of a garnishing order on the employer. If they do, employers can be prosecuted for breaches of section 27. See also the People's Law School's page on when creditors seek to garnish wages or bank accounts and the BC Supreme Court’s kit to apply to set aside a garnishing order. This page was last edited on 13 October 2018, at 09:17.